"Albert" was probably my favourite individual Synodontis that I have as yet kept. 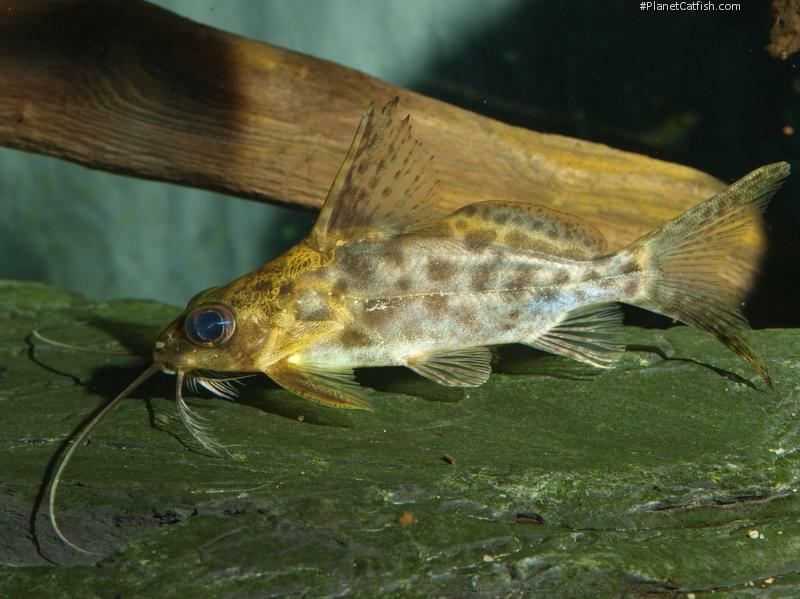 This is a difficult choice to make, but as a species S. alberti have a lot to offer the catfish enthusiast. The photo above is a separate individual which clearly shows this fishes unique (among Synodontis) long barbels. They also have unusually large "cute" eyes and an endeaing clownish manner. I've only ever seen S. alberti for sale sporadically since I first clapped eyes on one in 1985. On the subject of eyes, this species larger ones points to its very nocturnal existance, this is something of a shy Synodontis but, therefore, not a bad one for a more social aquarium.". Type Locality Kinshasa, Stanley Pool, upper Congo R., near Brazzaville, Zaire. Easily distinguished from other Mockokids by its long maxillary barbels and, relative to head size, large eyes. Feeding Sinking catfish pellets and bloodworm. The fish will also use the teeth in its lower jaw to scrape algae from rocks and the aquarium glass. Not a prolific algae eater however. Furniture Needs a rounded substrate. This species prefers wood to rocks. Plants are not required but seem to encourage daytime forays out with the mandatory cave / refuge. Compatibility Reportedly a loner, but so seldom available in numbers it would be difficult to establish a group in the aquarium. Will not eat healthy smaller fish, tankmates at around 1'' are safe with an adult. Will fight other catfish for a secure and dark refuge. Suggested Tankmates Most medium sized community fish. Will investigate and likely stress timid species with its unusually long barbels during the night.